So I’ve heard many people mention to me that they have seen things. Big Cats are an extremely common sight here in Central Victoria. 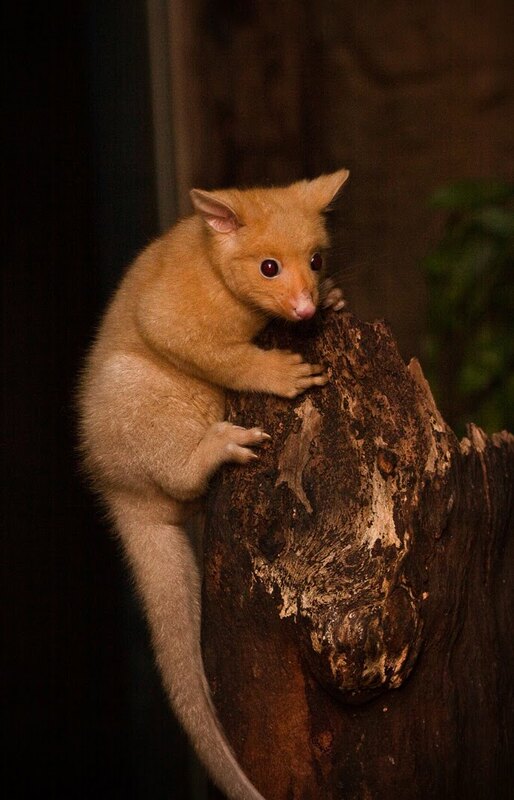 Thylacines are more fascinating, but then Yowies and Bunyips are even more exciting! People who have spoken to me are local people yet cover an area from Horsham to Gippsland. I’m yet to speak to some more people I have on my list, so they will come when they come. Josie is a new friend of mine, and she told me about this sighting at a Yule feast, so I decided to make her the first interviewed. Tania: Where do you live? Josie: I live in Ballarat now, but my family is from Amphitheatre, which is on the way to Avoca. It’s the start of the Great Divide. T: So is that the Pyrenees area? J: Yeah, the mountains look the same as the Pyrenees in France. A lot of it is original growth. It wasn’t cut back when it was settled. T: How long has your family been up there? J: Grandpa’s farm was selected by our family, so they’ve been there since settlement. T: How big is the land? J: 10,000 acres – it’s quite big. T: So, what have you seen up there? J: It was when I was about 13, I used to ride horses a lot with my cousins. I’ve got 58 cousins – it’s a huge family – so some of my cousins and I were riding along a dirt road that becomes bitumen later on when you go into Amphitheatre, into the actual town. Just before we got to the bitumen this big cat jumped across the road, and scared the crap out of the horses and we got bucked off. T: What did it look like? J: First we thought it was a dog, but it was definitely a cat, cause it had a big curved tail, kind of like a dusty brown and the top was darker, don’t know if it was black or brown. It came out from behind a tree and ran across the road into the bush. T: Do you think it was a feral or definitely a big cat. J: It was definitely a big cat, as it was the size of one. T: Cause of the tail? The tail and the shoulders are quite distinct. J: Yeah, and it had a flat head, like a big cat – the flat forehead, you could definitely tell it was not a dog. T: what time of day was this? J: Afternoon, we’d just had lunch. T: Was it in summer? T: Bit of a sceptic? J: Yeah, but she reckons one day she was up in the hills shooting with dad, they just heard this massive roar kind of sound coming from the other hills cause you can often yell from one hill to the other and it echoes clearly. T: Acoustics is good. Called Amphitheatre for a reason. J: Yeah, its all rocky – bush with rocky outcrops. There is no one living on the farm now, but we still own it. T: what else has your relatives seen? J: One of my cousins thinks he saw one over in Dunnolly – sort of near Amphitheatre, near Maldon. He was at a party and something was scaring the cows outside and they went out and they reckon they saw one. 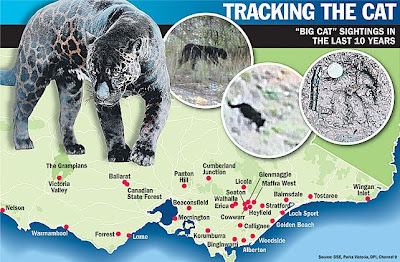 And on WIN (channel 9) news a few years ago there were footprints – they found big cat footprints in the area. T: Do you or your family have any theories about where they might come from? J: There are a few stories – one is that some people brought some back after the Second World was or something – had them as mascots and they got away or let them go. Then there’s the theory that a guy at Miners Rest had a circus – when he retired they were pets, but got away – they’re the stories I heard. T: What else is out there? Have you heard of anything else? 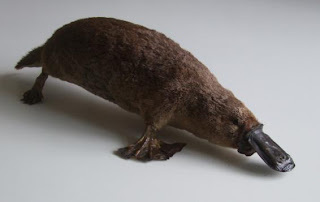 J: (Laughs) my sister thinks she saw a Bunyip. I don’t know if I believe her or not. T: What did she see? What was it? J: We don’t know. Mum reckons it might have been a sheep standing on its hind legs easting the trees. My sister was down at the creek one day, and she came running back and said that she saw it. T: How old was she? J: She was 12 – she is 18 now. T: Did she describe it? J: She said it was big and hairy and it was trying to hide in the trees, but she saw it and it ran off. T: Did it run like a sheep? T: She thinks? Wasn’t a Yowie possibly? T: Was it brown, or what it like a sheep – a pale brown colour. J: She said it was brown and black and furry. She said it was more furry that woolly, that’s why she’ll never to this day agree that it was a sheep. Coz she reckons it was furry. Not woolly. T: Do you think it was like a Yowie? Like a Bigfoot? J: Could have been. They’ve been seen sort of near there. J: Just rumours – further up north, in more forest areas, near Bendigo and Swan Hill. 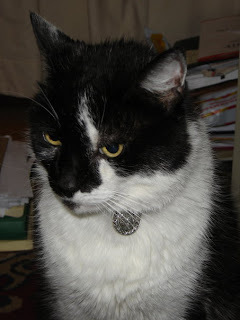 T: Was that on the property as well – where the cats are? J: Yep, they live in that area. T: You think they live in the hills? J: The rabbit virus never really took hold – lots of rabbits up there - that’s probably what they eat. I’ll never forget that cat though. It scared the hell out of me and the horses. And the one we saw on the footage on WIN news 5 or 6 years ago looked like the same. 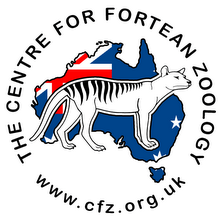 T: You haven’t heard of any Thylacines in the area? J: Only further south, near the Otways. J: That’s certainly a hotspot. Of course after hearing about her sister’s sighting, I thought this interview was far from over. 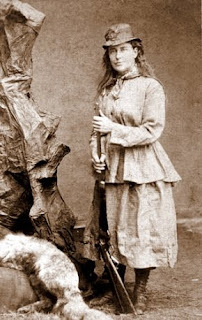 But then I’ve not yet met her sister, except for a short phone conversation and an email but she has not replied to my request – so I am not sure whether she wants to be interviewed about it, or whether it really was just made up by her. Josie seems rather dubious about her sister’s story, so I am not sure what to believe. 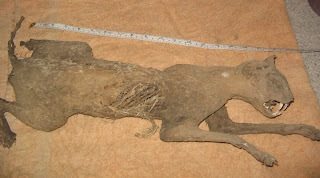 That's what the folk over at the Invasive Animal CRC are wondering, after they received these eye-popping photos of a mummified monster moggy discovered underneath a farmhouse near Canberra in the ACT. Well, tongue-in-cheek we suspect! 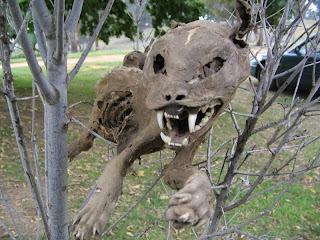 While we're sure they're curious as to how a domestic cat could get so big - its dried mummified husk measures @ 20 inches from nose to the base of its tail (one imagines it was a reasonably hefty beast in its prime) - we're reasonably confident they don't really believe it's the sort of 'big cat' being sighted across Australia. But it's one bloody BIG cat - and when compared to resident CFZ moggie Otto's generous proportions, it does give one more than 'paws' for thought - even if it is only a few inches longer than your average moggie. What tickled us was the debate over whether this crusty corpse was that of a dog or a cat. It's clearly the latter - perhaps it's time for an education campaign to help people identify everyday animals! Left: Otto the great, living large. 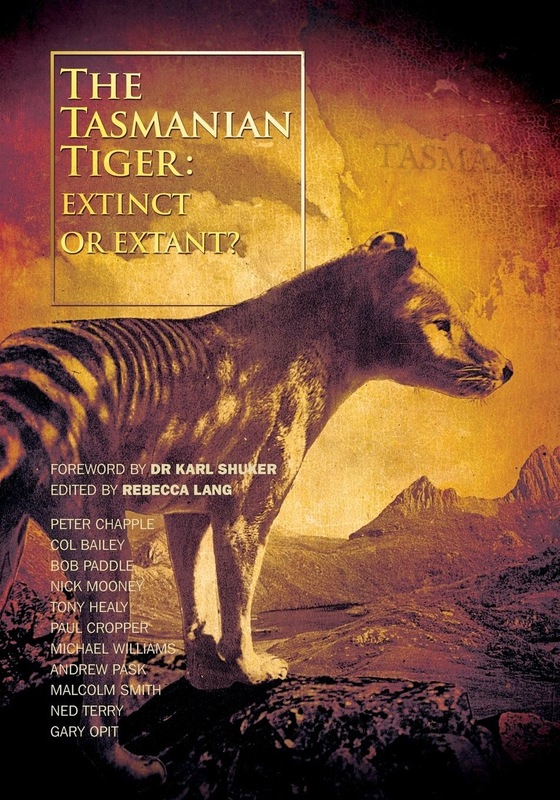 The launch of CFZers Mike Williams and Rebecca Lang's book, Australian Big Cats: An Unnatural History of Panthers, is getting closer. Have you seen a strange Australian animal? We're interested in hearing about rare, endangered and extinct animals indigenous to Australia - and out-of-place animals as well.